Wind is caused by the uneven heating of the atmosphere by the sun, variations in the earth's surface, and rotation of the earth. Mountains, bodies of water, and vegetation all influence wind flow patterns. Wind energy (or wind power) describes the process by which wind is used to generate electricity. Wind turbines convert the energy in wind to electricity by rotating propeller-like blades around a rotor. The rotor turns the drive shaft, which turns an electric generator. Three key factors affect the amount of energy a turbine can harness from the wind: wind speed, air density, and swept area. Mechanical power can also be utilized directly for specific tasks such as pumping water. The U.S. Department of Energy developed a short wind power animation that provides an overview of how a wind turbine works and describes the wind resources in the United States. The U.S. Department of Energy defines the scale of wind turbine technologies as follows: utility-scale is greater than 1 megawatt (MW) in size, mid-size turbines are 101 kilowatts (kW) to 1 MW in size, and small turbines are up to 100 kW in size. Distributed wind systems are defined as systems connected on the customer side of the meter (to meet the onsite load) or directly to the local grid (to support grid operations or offset large loads nearby). Community wind is characterized by local ownership and control and includes many distributed wind projects. Offshore wind projects, of course, capture the winds off the coasts and convert them to electricity. Learn more about the technology classes at the links below. The Energy Department provides publications, data, analysis, and more regarding wind energy research at R&D labs and facilities. Learn more at the Wind Technology Resource Center. DOE's Wind Energy Technologies Office works to improve the performance, lower the costs, and accelerate the deployment of innovative wind and water power technologies. Greater use of the nation's abundant wind and water resources for electric power generation will help stabilize energy costs, enhance energy security, and improve our environment. WINDExchange is a nationwide initiative designed to increase the use of wind energy across the United States by working with regional stakeholders. 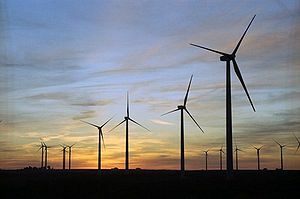 The WINDExchange program illustrates the Department of Energy's commitment to dramatically increase the use of wind energy in the United States. The WINDExchange website provides a wide range of wind-related information, including: State-by-state breakdowns of wind resource potential, success stories, installed wind capacity, news, events, and other resources, which are updated regularly. The National Wind Technology Center (NWTC) is the nation's premier wind energy technology research facility. The goal of the research conducted at NWTC is to help industry reduce the cost of energy so that wind can compete with traditional energy sources, providing a clean, renewable alternative for our nation's energy needs. The amount of land required for a wind farm varies considerably, and is particularly dependent on two key factors: the desired size of the wind farm (which can be defined either by installed capacity or the number of turbines) and the characteristics of the local terrain. Typically, wind turbine spacing is determined by the rotor diameter and local wind conditions. Some estimates suggest spacing turbines between 5 and 10 rotor diameters apart. 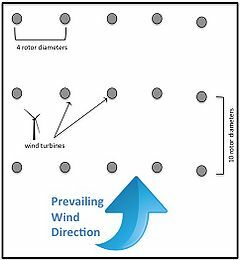 If prevailing winds are generally from the same direction, turbines may be installed 3 or 4 rotor diameters apart (in the direction perpendicular to the prevailing winds); under multi-directional wind conditions, spacing of between 5 and 7 rotor diameters is recommended. The amount of energy in the wind varies with the cube of the wind speed; in other words, if the wind speed doubles, there is eight times more energy in the wind ( ). Small changes in wind speed have a large impact on the amount of power available in the wind. The more dense the air, the more energy received by the turbine. Air density varies with elevation and temperature. Air is less dense at higher elevations than at sea level, and warm air is less dense than cold air. All else being equal, turbines will produce more power at lower elevations and in locations with cooler average temperatures. The larger the swept area (the size of the area through which the rotor spins), the more power the turbine can capture from the wind. Since swept area is , where r = radius of the rotor, a small increase in blade length results in a larger increase in the power available to the turbine. Wind Atlas Analysis and Application Program (WAsP) is a PC program for predicting wind resources and power productions from wind turbines and farms. OpenEI has a Map of Wind Plants, which displays a comprehensive list of wind plants, seeded with United States data with plans to expand internationally. ↑ 1.0 1.1 "US DOE EERE: Wind Energy Technologies Office: How Wind Turbines Work"
↑ "Alaska Energy Authority. Introduction to Wind Resource Data"
↑ "U.S. Department of Energy. 2014 Distributed Wind Market Report"
↑ "U.S. Department of Energy. 2012 Market Report on U.S. Wind Technologies in Distributed Applications"
↑ "U.S. Department of Energy. Offshore Wind Technology"
↑ "EERE Wind Energy Technologies Office"
↑ "AWEA: Ten Steps to Developing a Wind Farm (Updated 3-2010)"
↑ 9.0 9.1 "Wind Power Project Site Identification and Land Requirements Prepared by: Global Energy Concepts and AWS Truewind, LLC"
↑ "Wind Energy Development Programmatic Environmental Impact Statement: Wind Energy Basics"